You Fell Down a Stairway? Now What? 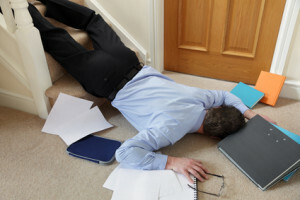 Home » Personal Injury News & Developments » Premises Liability » You Fell Down a Stairway? Now What? If you have fallen down the stairway, you are likely suffering serious injuries. This is because as your body fell, it had the potential of striking many hard surfaces before the falling stopped. As a result of your injuries, you are likely facing extensive medical bills, time away from work and financial obligations that are difficult to meet. So exactly what are your legal options for seeking recompense to pay your bills and recoup your lost wages? Property owners of movie theaters, offices, hotels, houses, buildings, shopping malls, grocery stores, restaurants or other buildings have a legal responsibility to maintain or fix any broken step, damaged stairway or problem with the stairwell. In addition, the staircase and stairway areas must be continuously maintained, well lit and secure to ensure the safety of everyone who uses it. If the stairway you used was unsafe and your fault caused injuries, the property owner, manager, tenant or occupant can be held legally liable for your damages. You have the legal right to seek and obtain fair and full monetary recovery for all of your losses, injuries and damages. However, seeking compensation in slip and fall premises liability cases can be complex. Because of that, it is essential to hire a personal injury attorney who specializes in premises liability cases. Skilled legal representation can help you win a fair settlement or jury verdict. Your attorney will need to carefully investigate your claim and prepare a solid case using evidence, eyewitness accounts and the testimony of professional experts. Dangerous or slippery conditions existed on the stairway. Those in charge knew or should have known that the dangerous condition existed and took no action to remedy the problem. Your injuries are a direct result of the fall that happened due to the unsafe conditions on the stairway. Even if the property owner or others in charge of the premises were unaware of the problem, liability can still exist. Your attorney will need to show how any reasonable individual in charge of the stairway could have discovered the dangerous conditions and take remedial actions. Stairway slip and fall cases, like most personal injury claims, are accepted by reputable attorneys on contingency. In other words, your attorney’s legal services will only be paid after winning a court award or negotiating an out-of-court settlement. Hiring a season premises liability attorney will assure you that all your documents are filed before the expiration of the statute of limitations. Your lawyer will handle every aspect of the case to ensure it reaches a successful conclusion. The law firm you choose will likely offer a no-obligation free initial consultation to discuss the merits of your claim and provide you various legal options to resolve your case.